Million dollar view from this 3 Bedroom, 3 Bath penthouse on the beach. May be the best view on Okaloosa Island -- see all the way to Navarre and past the Okaloosa Pier as far as the eye can see toward Destin, just six miles to the east. This beautiful unit is on the perfect floor to watch the dolphins, seagulls and activity on the beach from the huge 32 foot balcony. Watch the boats on the Intercoastal Waterway and have a front row seat for holiday fireworks from front walkway. Everything has been renovated and updated. Master suite is a dream ..... separate shower, whirlpool tub, vanity area, large walk-in closet, sliding glass door to balcony. Kitchen is wonderful with a horseshoe shaped breakfast bar, separate lighted wet bar, ice maker, garbage disposal, fridge with water & ice through the double door, ceramic glass top stove, built-in microwave. Master bedroom has king-sized bed, one guest room has private bath and a king-sized bed, another guest room has 2 sets of bunk beds; one with full sized bed underneath. Extra sleeping with raised queen sized Aero-bed. All with huge closets, television sets, DVD players. Washer and dryer and second refrigerator add to the convenient features. Island Echos amenities include: seasonally heated Gulf front pool (usually January to mid-March), picnic and barbeque area, shuffleboard court, lighted tennis courts. Best amenity, of course, is the gorgeous Gulf of Mexico with wide, snow-white beach and clear, clean emerald-green water. This is a wonderful condo, very spacious, with an awesome balcony overlooking the clear emerald-green waters and sugar-white sands of the spectacular Gulf of Mexico. Island Echos is one of the favorite destinations for families visiting the Emerald Coast. It's a mid-rise with only seven stories. There are plenty of amenities on site, plus all the amenities of Fort Walton Beach and Destin just a few minutes away. The Non-Smoking condo has recently been renovated and has new furnishings and new appliances. It's decorated in a very pleasing Florida style which is warm and inviting. The master bedroom has a king bed, large TV, VCR and stereo. The second bedroom has a king bed, TV & VCR. The third bedroom has 2 sets of bunk beds -- one with a full mattres under, TV & VCR. All bedrooms have spacious bathrooms. In addition, there is a queen sized raised Aero bed for extra sleepers. The balcony is a pure delight with plenty of lounge chairs and outdoor eating area. The views go on forever in both directions. Watch the dolphins frolic from the balcony. Don't miss the exciting fireworks display on Okaloosa Island at the Okaloosa Island pier. Starts at 9 sharp on Wednesday nights through the summer. Hi, Y'all. My name is Angela Parkhurst and I'm fortunate to live in the very area where this condo is located. It's paradise on earth along this Emerald Coast. This makes it easy to manage my rental unit and be quick to resolve any issues (very few so far) that can arise. I am the proud mother of three wonderful men --- Jason, age 41, a professional photographer who travels all over the world taking photos for such publications as Sports Illustrated and USA Today, Cameron (Jason's twin), who lives in Atlanta and works very successfully in the wonderful world of finance and is the proud and doting father of Madison (age 7) and Carter (age 5). My youngest son, Clark, age 38, lives in Los Angeles, CA where he works in the movie and ad industry. I also am the proud and doting Mom of a Schnoodle named Lulu. Please come visit us. 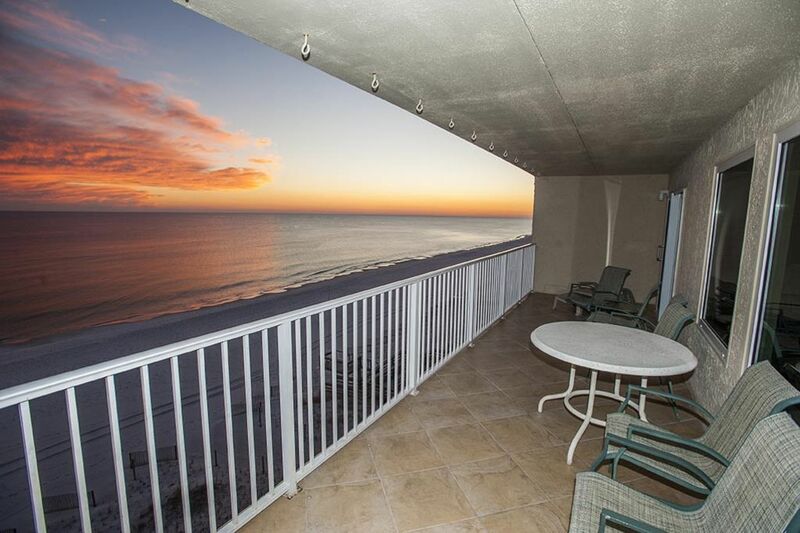 You'll love the condo and the incomparable view of the Gulf of Mexico. I actually bought the unit and lived in it for three years so it has a lot of upgrades that other units don't have. The Destin/Fort Walton Beach area is one of the most beautiful areas on this earth --- snow white sandy beaches, clear and clean emerald green waters. There's plenty to do with over a hundred golf courses within 50 miles, water parks, wonderful restaurants, snorkeling and scuba diving and fishing beyond compare. Brand new exercise room is now open. Brand new fitness room on-site with new, commercial equipment. Water and ice through the door. Side by side fridge. 2nd fridge in hall closet. Seasonally heated, Gulf front pool. The condo was very nice. It had not been cleaned when we arrived at 5:00pm. It took about 2 hours for the cleaning crew to get there and clean it. That was very inconvenient. We wanted to change and take showers before dinner but could not. We knew before hand that we could not use the balcony. However, the windows in the front do not open so you could not even get a cross breeze or hear the ocean. We also did not realize that there would be so much construction going on. You never had any privacy because you never knew when a workman would be working on the balcony! The owner was very accessible and when a problem arose she quickly responded. Even with the few problems we encountered we would still stay here again. The problems were out of the owners hands and she did what she could to make things right. However, if we had known about the construction we would have cancelled our reservation. Perfect accommodations for our wedding guest group. Loved the ocean access, the beautiful kitchen, and the quiet upscale accommodations. Always a pleasure working with Angela! Island Echos was in the beginning stages of a complete renovation. The view remained beautiful! Everything should be equally as beautiful when complete. You both are the perfect tenants. I appreciate your understanding, compassion and patience during this most trying time. I hope you have a beautiful "new" building to come home to next year. Thank you so much. Great place— perfect location!!! Enjoyed our stay!! Until had plenty of kitchen items— if needed the extra fridge is a plus!! Will definitely look at staying again!!! Beautiful views and very spacious! We loved our time at Island Echos! Every year for the last 5 years, 7 of us sister/cousins get together there for a girls trip. This was our first time in this condo and we couldnt have been happier! Despite a hurricane coming within 50 miles, our time there was very enjoyable. The owner, Angela, kept in contact to let us know what was going on with anything regarding the storm. The condo was spacious enough for us to all have room to sit and talk or get some time away. The balcony was just perfect for amazing views! The kitchen was well stocked and having an extra refrigerator and separate ice maker was ideal. Tropical paradise is closer than you think.....it's on Florida's Emerald Coast situated on the Gulf of Mexico. Florida's panhandle has for many years been awarded accolades from many tourist publications including Southern Living. Enjoy the softest, whitest sandy beaches, the clear emerald-green water with plenty of activities to interest vacationers. Within a day's drive from most Southeastern cities, the Fort Walton Beach/Destin area is a popular destination. You'll never be bored with the 28 top ranked golf courses, tennis facilities, fishing, watersports, hiking and biking trails, dolphin watching, nature preserves, historic forts, museums, water parks, incredible restaurants, boutique and bargain shopping. Or, just chill on the uncrowded beaches. It's a great place to vacation year-round -- even winter enjoys nearly 70 degrees of sunshine. The people here are friendly and are happy to extend their 'southern hospitality,' the pace relaxed; most guests are repeat visitors.